Payroll, bills, accounts receivable, endowments, deposits, cash flow. All of these and more are business terms I need to know in working for the Morrison County Historical Society. I like business. The interchange of money and its effects are fascinating. Since working at the museum, I have found that my interest may be familial. My great grandfather, John Vertin, was a business man in Little Falls. He must have had quite an influence on the history of the area, because his name keeps popping up in various sources at the museum. I decided to dig a little further for more information on John Vertin, so I turned to the Vertin family file first. The MCHS family files give basic genealogical information about the families in Morrison County. From the family file I learned that John Vertin was born in Dobliche, South Austria in 1866 and came to America in 1881. He lived with his uncle, Peter Maurin, for ten years and in 1892 he moved to Little Falls to manage the Maurin and Medved General Store. In 1894 he married Agnes Miller. Together they had eight children: Marc, Mathias, Bernadine, Rose, John, Margaret, Agnes and Florence (my grandmother). In 1898, John Vertin started his real estate business. He also sold insurance. John had the Vertin Building erected in 1915 and it still stands today at 70-74 East Broadway. According to my grandma, business was quite good for John Vertin, except during the Depression years. Apparently, he was a well-respected business man. He served on the city council for three terms and was city treasurer for 44 years. That’s quite a long time to hold any public office. John Vertin was also involved with several other local organizations and was president of the Chamber of Commerce at one time. The other Vertin box contains correspondence from John’s business. This is an interesting box. Because John was in real estate, he dealt with many community members and businesses and, through his letters, he had much to say about our area. He didn’t know that he was writing history at the time he composed his letters. He was just doing business as usual. A letter from Minnesota Farm Lands Association, Inc. to John Vertin in November 1915 states, “Our Association as you know, are very much interested in the development of Minnesota, particularly in those things that go to help us out as Land Men.” This letter precedes many letters dealing with the development of the Ft. Ripley/Randall area as a possible iron ore mining site. The sale of land was dependent on many variables such as the season of the year, the quality of the land and societal events. In a letter dated February 7, 1916, from Herbert J. Putnam of Old Reliable Real Estate Agency to John Vertin, Mr. Putnam questions whether his land contains iron ore. He also states, “I note there is a silica sand found in that county that is rare and valuable to make an expensive glass used in laboratories. Is this true?” In a reply dated February 10, 1916, John Vertin does not mention the silica sand but states, “I do not know of any iron company that is really in active operation that has acquired lands in our county.” He goes on to say, “There seems to be plenty of money in the country, still this horrible war raging, everybody seems to be a little pessimistic.” In a letter dated March 29, 1916, to Henry Mann of Los Angeles, California, John writes, “the land business has been very quiet this last year, and of course for this season, it is a little early. We had considerable snow here this winter. They are still using sleighs in the country.” At that time, it is not difficult to see why land sales weren’t good in the winter. People had a harder time traveling to view the lands they wished to buy. Farmland was much in demand when John was selling real estate. He had a no-nonsense way of telling his customers the quality of their lands. In a letter written January 22, 1920, to Mr. R. Rosenberger of Sterling, Colorado, John states, “You write you have a little better quarter than the rest of the land in that locality. I looked your quarter over very carefully last summer, and there is a very small part of it in the northwest corner that is tillable land. The balance of it is quite rolling and stony, and the southwest part of it is ratherwet, tamarack and spruce swamp. If this had been desirable farming land, it would have been sold long ago.” Later in this letter, to add insult to injury, John adds, “Some of course use the expression that they would not take the land for a gift, as they would not want to live in that country.” The land in question is in the Cushing area. Little did my great grandfather know that I love the rolling lands in the Cushing area and would buy acreage there in a heartbeat if funds would allow. I do have to admit, this tough attitude is probably the reason that John Vertin was a good business man. A wise business person diversifies his business so that if one area becomes sluggish, the other will hopefully make up for it. So it was for John Vertin. To keep him and his family going during periods of depressed land sales, John sold insurance. In a letter dated August 11, 1921, to his cousin, M.P. Maurin, John writes, “As far as my real estate business is concerned, there is absolutely nothing going on. The only thing that keeps us alive is a little insurance business that I have.” John wrote insurance for many organizations in the area including the Morrison County Lumber Company, Broadway Grocery Company, the Board of Commerce, Little Falls Black Granite Company, the Church of Cushing and Little Falls Vulcanizing Company. Through John Vertin’s letters, I can feel my connection to the history of Morrison County and Little Falls. With this article, I have barely touched upon all of the information the Historical Society has about John Vertin. In addition, I am fortunate to have John Vertin’s daughters (Florence, Agnes and Margaret) to talk to about their father. I am proud to be genetically linked to John Vertin and his business acumen. 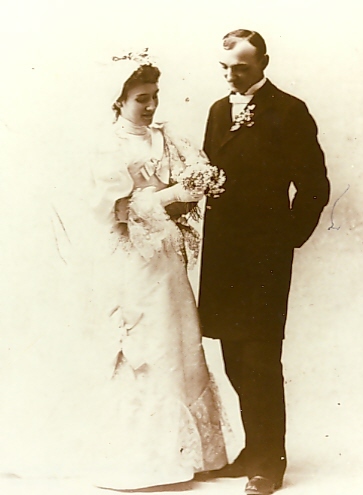 John Vertin & Agnes Miller wedding photo, November 27, 1894, photo from the Morrison County Historical Society collections. 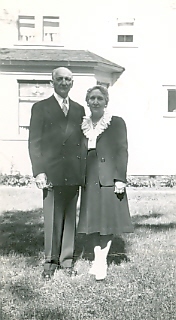 John & Agnes Vertin, Little Falls, MN, undated photo from the collections of the Morrison County Historical Society. My sister and I have been doing research on our grandfather, Joseph Vertin. He was a younger brother of your John Vertin, and lived in Breckenridge, MN from 1895 on. My mother was the daughter of Joe and Minnie Vertin. I was wondering if the information you found in your research included any information on their parents, Matthias and Katherine (or Katrina) Vertin. Her maiden name was Maurin. Matthias had 4 wives, so that gets a little confusing. We do have some information on all 4 wives, but would like to be able to go back a step behind Matthias if possible. Thank you for any assistance you might be able to offer for John and Joseph Vertin and their family tree. Joann – In looking at our Vertin Family File, I see that we have very little on Mathias and Katrina. According a to WPA biography of John Vertin, Mathias was born in 1837 and Katrina was born in 1846. John and Joseph were both born in Dobliche, Austria. We have a funeral card for Joseph that says he was born March 29, 1876, in Austria, and came to America in 1891, living with Uncle Peter Maurin in Elizabeth, MN. This is the same path John took. Joseph attended St. John’s University in Collegeville, MN, in 1893, and went to Breckenridge in 1898. He married Wilhelmina Jansen in Moorhead, MN, on November 14, 1905. Likely you have this information on Joseph, so it’s not that helpful. Unfortunately, there’s nothing else on Mathias and Katrina in the file. I see from Joseph’s funeral card that he was preceded in death by his wife, parents, 3 brothers (Peter, John & Mathias), 2 half-brothers (Rudolph & Frank), and a half-sister (Mary). He is survived by his half-sister Mrs. Gaston (Frances) Plat of San Jose, California. Perhaps there are clues to be found in following the half-siblings. Thank you for checking into this for our family. Having the dates of birth for Mathias and Katrina will be helpful in looking into that generation. Instead of looking for Vertin or Maurin, I decided to google Dobliche and found a connection that way. If I am able to locate any other information, I will pass it your way and you can add it to your files on John Vertin. Thank so much for your reply!! My name is Beth Vertin. My grandfather was Marcus J. Vertin. He was the son of Mathias Vertin. My grand father was born in San Jose, CA so at some point Mathias must have moved to CA. Contact me if you want other info.